NVIDIA has taken to using CES as its platform for launching members of its Tegra mobile SoC family. This year was no different as it shifted branding a bit in its announcement of the Tegra K1, formerly known as Project Logan. With Tegra 2 NVIDIA’s big selling point was being first to dual-core in Android. Tegra 3 attempted to do the same with being first to quad-core. Tegra 4 just made things faster. Tegra K1 on the other hand does away with the gimmicks and instead focuses on fundamentals. The SoC will come in two versions, one version with a quad-core (4+1) Cortex-A15, and one that leverages two of NVIDIA’s own 64-bit ARMv8 Denver CPUs. More importantly, they both ship with a full implementation of NVIDIA’s Kepler GPU architecture. In fact, Tegra K1 marks a substantial change in the way NVIDIA approaches mobile GPU design. From this point forward, all mobile GPUs will leverage the same architectures as NVIDIA’s desktop parts. As if that wasn’t enough, starting now, all future NVIDIA GeForce designs will begin first and foremost as mobile designs. NVIDIA just went from playing with mobile to dead serious in a heartbeat. 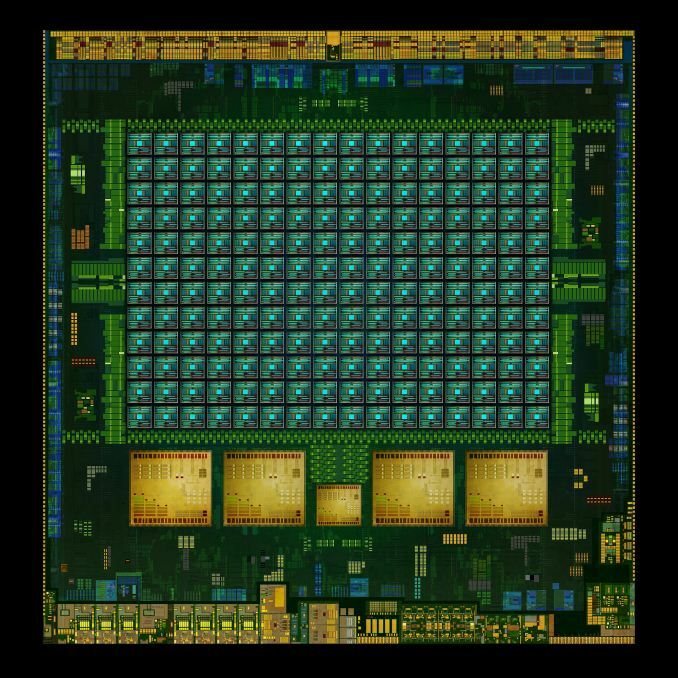 Tegra K1 will also be NVIDIA's launch vehicle for Project Denver, it's first fully custom ARMv8 CPU core. More on that in a bit. 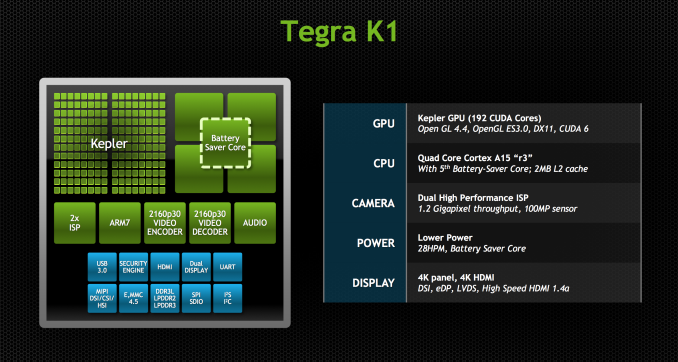 Tegra K1 will ship in two configurations. The first went into production at the end of December 2013, is shipping to OEMs this quarter and will be in devices, allegedly, in the first half of 2014. This first configuration is based on ARM’s Cortex A15 CPU core. Much like Tegra 4, the A15 version of Tegra K1 features four Cortex A15s synthesized for high frequencies and a fifth Cortex A15 that’s optimized for low power/frequency operation. The fifth core, what NVIDIA likes to call a shadow or companion core, is swapped in during periods of very low CPU usage (e.g. idle, screen off in your pocket updating new tweets/emails). As CPU demands grow the companion core is switched out for one of the four high performance cores, then two, then three and finally all four can be plugged in at once (but never five). 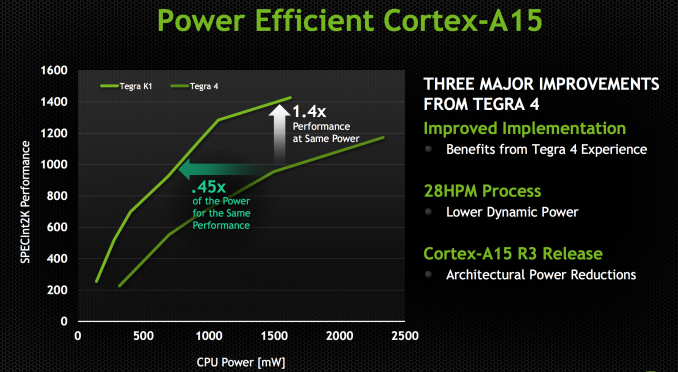 Tegra K1 ships with a newer revision of the Cortex A15 (r3p3) than what was in Tegra 4 (r2p1). ARM continuously updates its processor IP, with each revision bringing bug fixes and sometimes performance improvements. 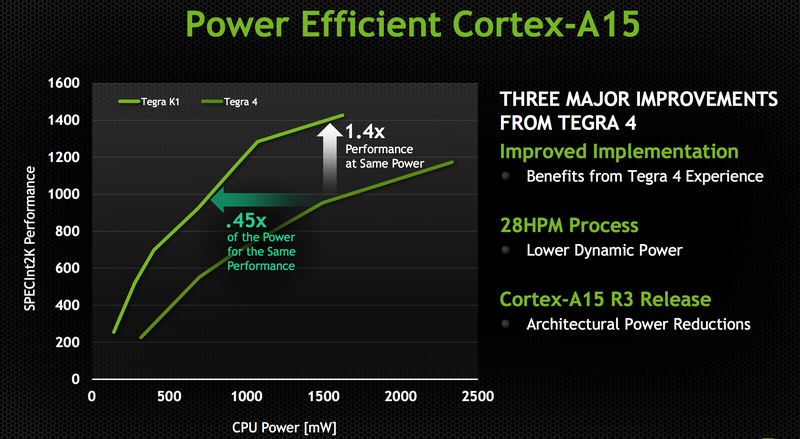 In the case of Tegra K1’s A15s, the main improvements here have to do with increasing power efficiency. With r3p0 (which r3p3 inherits) ARM added more fine grained clock gating, which should directly impact power efficiency. The combination of the newer Cortex A15 revision and the move to 28nm HPM give Tegra K1 better performance at the same power consumption or lower power consumption at the same performance level. The reality tends to be that mobile OEMs will pursue max performance and not optimize for a good performance/power balance, but it’s at least possible to do better with Tegra K1 than with Tegra 4. The max CPU clock goes up from 1.9GHz to 2.3GHz, a direct result of the move to 28nm HPM; 2.3GHz is the max CPU clock regardless of the number of active cores. The max performance increase over Tegra 4 running at max clocks will be just over 20%. NVIDIA hasn’t made any changes to the L1/L2 cache configuration with Tegra K1. We’re still dealing with a shared 2MB L2 and 32KB/32KB L1s (I$+D$) per core. The companion core can scale up to 1GHz, but tends to run at around 500MHz. Feeding the CPU (and GPU) cores is a 64-bit wide LPDDR3 memory interface. NVIDIA will offer Tegra K1 in PoP, discrete and another package revision for standard clamshell notebook use. Not true. v8 introduces new MMU design and page table format and other enhanced features, which are not readily compatible to a straightforward "re-compiled" kernel. This is no different than the AMD64 implementation, the Linux kernel will gain a few improvements to make it work perfectly on that specific architecture extension, the same is likely going to happen to aarch64. That means, there's no reason to make a 32-bit version of ARMv8. ARMv8 will be able to encompass and execute both 64-bit and 32-bit software. ... You can already get Kepler Steam boxes. They use desktop Kepler GPU's.